There was a lot on my mind that day, sandboarding down the steep, sandy dunes of Death Valley. 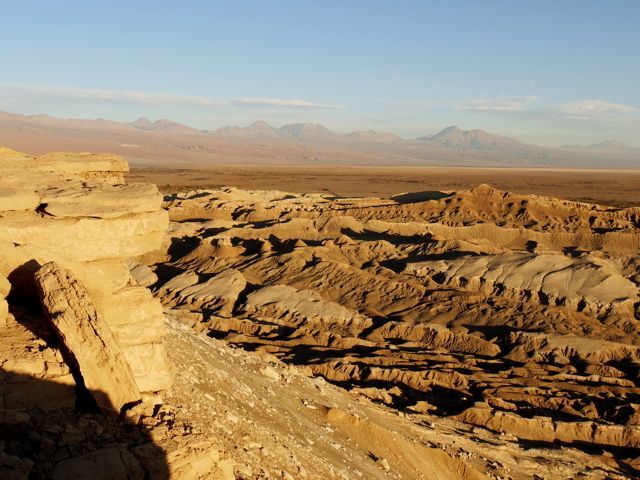 I was thinking about the differences between traveling now as opposed to ten years ago, before the conveniences of digital cameras, iPods and internet terminals in the middle of the Atacama desert. The Atacama was also on my mind, literally, as I roly-poly’d my way down the dune after taking another wonderful wipeout sandboarding. On my mind, in my mouth, up my crack…the desert here is truly all encompassing. San Pedro proved a relaxing, albeit dusty outpost to gather myself after the breathtaking three day drive from Bolivia. Quiet, save for music pouring out the dozen or so cafe-restaurants, the desert here is amongst the driest places on earth, the stars like the twinkle in the eye of an evil villain about to unveil his latest weapon. It had taken me the better part of a day to update my website, as high speed internet had yet to penetrate this part of the world, (although the same cannot be said for buses of German tourists). Walking down the Caracoles main drag for the hundredth time I spontaneously decided to rent a bike and ride to the Valley of the Moon. The guy at the shop gave me a hand drawn map, assuring me that it would be no problem to ride the 16kms or so into the desert this late in the afternoon. At least I think he was assuring me, as he spoke no English. No sooner was I a few kilometers into the Atacama than the front tire deflated, the sun cranked up the thermo and my small bottle of water seemed vastly inadequate for the undertaking. Nevertheless, the landscape was as flat as a bottle of opened Sprite out the fridge, and the hugeness of the desert drew me further. By the time I reached the Valley of the Moon, I was well proud of myself, expecting to round a corner and find a massive view for my Pentax to pucker. Instead, the road kept going, deeper and deeper, with alarmingly little traffic and steep downhills to gee-whiz myself further into trouble. Finally I dismounted and climbed over the crunchy sand to the top of a rocky hill, better to gauge my surroundings. It was here that the silence of this dead world deafened me; where scant a shrub would dare to grow. This is the desert of death, a sentiment shared by the Spanish who slaughtered thousands of Incas on a hill nearby. My tongue could have sanded down a tree into a coffee table, so I meditated (ie prayed) for the energy to somehow pedal my way home. Fortunately I caught a glimpse of another bike struggling in my direction, its rider obviously in the same predicament. The rider turned out to be Ken from Japan, a smashing chap with a toothy grin, and the relief of finding someone to share the suffering overwhelmed us both. “I don’t know what we’re supposed to see out here,”said Ken, as we puffed and pedaled our way towards the town.